*Contains 11 mg sodium per capsule. Non-medicinal ingredients: microcrystalline cellulose, polyethylene oxide, silicon dioxide, sodium stearyl fumarate. Capsule: hypromellose, chlorophyll. AOR Guarantees: that there is no more than 5 mg of S-lipoic acid per capsule, and that no ingredients not listed on the label have been added to the product. Contains no wheat, gluten, corn, nuts, dairy, soy, eggs, fish, shellfish or any animal byproduct. R-lipoic acid and N-acetyl-cysteine provide exceptional antioxidant coverage, and the multitude of health benefits derived from this combination is astounding. Lipoic acid and NAC tend to be very short-lived in the blood. 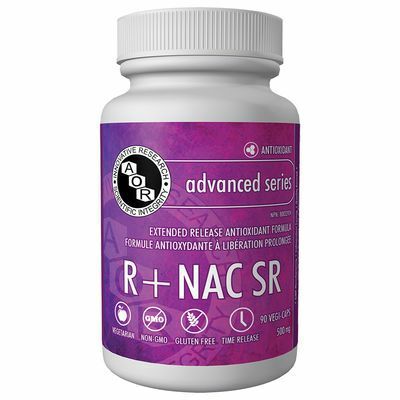 R + NAC SR is specially formulated to ensure greater stability and accessibility to the body than conventional lipoic acid and NAC supplements. It is designed to provide a sustained release of these nutrients over 8 hours, providing continuous resistance to free radical damage and numerous other health benefits. Primary Uses: R-Lipoic acid provides antioxidant protection in the mitochondria and also helps to reduce the damaging effects of age. NAC is a highly efficient form of cysteine. Cysteine is the most important precursor for glutathione (GSH), one of the body's hardest working antioxidants. R-Lipoic acid and glutathione recycle each other and other antioxidants, keeping them fighting off free-radicals longer. Secondary Uses: Both R-lipoic acid and NAC play roles in cardiovascular health, neurological protection, heavy metal chelation, blood sugar management, liver protection and more. R + NAC SR is the perfect duo for those looking for continual antioxidant protection and anti-aging benefits around the clock. D, Breslow JL. Lipoproteins (a) reduction by N-acetylcysteine. (1991).The Lancet; 337: 203-4. De Flora S, Grassi C, Carati L. Attention of influenza symptomatology and improvement of cell-mediated immunity with long-term NAC treatment. Eur. Respir J. (1997).10: 1535-1541. Flanagan, R. Use of N-Acetyl cysteine in clinical toxicology. AM.J. Med. (1991).91: 131-9.